21:00 - 24:00 - party with Radio Groove On and DJ guest. The 30 lei doantion includes the entrance fee and meal! 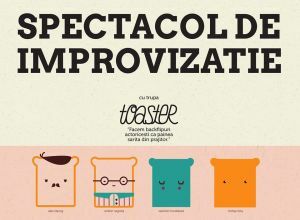 "Improvisation Theatre w. Toaster and After Party " Theatre in Bucharest. You can get here description, reviews, address, time and details of "Improvisation Theatre w. Toaster and After Party " Theatre in Bucharest. Visit Bucharest Tips for more Theatre events in Bucharest!